It’s obviously important to have as good a strategy as possible in any company, but especially in the dynamic, fast-moving markets that software and hardware companies often compete in. But I also subscribe to the old notion that it’s better to have an average strategy with great execution than the other way around. At the end of the day in most cases, execution is key. 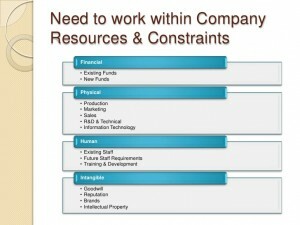 So one of the things I like to explore when developing strategy for a company or product line is “what are the real constraints” that will impact that strategy? Because time and time again, a “great” strategy developed in a vacuum, without a solid understanding of these real impediments tends to fit into that sad category of a “great strategy–implemented poorly”. That’s because it was doomed from the beginning, regardless of how creative and forward-thinking the said strategy was. Government vs. Commercial – This is one of the more difficult issues to overcome, in either direction. Pure government contracts have an atrocious track record of trying to enter commercial markets, for a variety of cultural and structural reasons. Pure commercial companies have very little chance of getting traditional government contracts without the right contacts or experience, although it’s possible for commercial companies to gain considerable government business outside of traditional contracting. Both of these issues can be overcome, but not without eyes wide open. You can read more about the differences between government and commercial sales & marketing here. Top management biases and attitudes – This is hard to characterize as it comes in a variety of forms. But I have found that senior managers often suffer from “comfort disease” whereby they only feel right doing things in the same manner (and sometimes with the same people) which has worked well for them in the past. If the new strategy is taking you off in a new direction that requires a different approach–no matter how promising–this can become a real problem. Current corporate focus vs. strategy – Similar to the above point, sometimes it’s not attitudes/biases of management that is the issue, but it is due to the current business the company is in. In these cases the existing staff and other corporate resources may not be well matched to what is required to execute the new strategy. $B product ideas & $M companies – Sometimes the management and staff are fully capable of executing the new strategy, but corporate budgets and other required resources are just not adequate to bring the product to the market in the required fashion, or to compete in the new market segment in the long term. $M products ideas and $B companies – Conversely, if you come up with a nice multi-million dollar product idea in a multi-billion dollar company, the idea is often doomed from inception. That’s because it takes a certain amount of fixed resources to launch/focus on anything new, regardless of the ultimate revenue derived from it. Multi-million dollar products don’t move the needle in a multi-billion dollar company, making them uneconomic and doomed to fail from lack of attention if nothing else. Ability of the sales force/distribution channel sell this particular product – Sometimes this is because the new product is much more complex that what is currently being sold, or needs to be sold to a different customer segment than the current sales operation focuses on. Sometimes for economic reasons a direct sales-oriented company needs to sell a new product via channels and doesn’t know how; in other circumstances a new product really requires the added attention of a direct sales personnel and the company just doesn’t have the internal sales resources to be successful with it. There are a variety of potential issues of this nature; the important point is that you need to make sure your new product strategy is well match with your sales/distribution capabilities. Ability of the sales force sell ANY additional products – This one is sort of surprising but I discovered it the hard way through personal experience. One would think that adding complementary products which can be sold to the same customers would always be a good thing for a sales force/channel. But it just ain’t so. Like anyone else, sales folks have a finite capacity on how many things they can master and focus on. If you add one too many products into the sales bag, you are likely to find it completely ignored. Developer/techie markets vs. corporate/SMB markets – Many times a software or hardware technology will initially be developed and targeted at other software developers or an engineering market segment. This can often work well; we call them “next bench” products as the product developers understand the target market well — because it is essentially themselves. But when a company tries to extent that technology or develops a new product technology for traditional corporate customers, things can then easily fall apart. Not only are the ease-of-use requirements much more demanding for corporate end-users than engineers or software developers, but the marketing and selling methodology can be very different as well. International vs. Domestic – This issue is a pretty simple one to understand and one I believe nearly every company needs to overcome, or their growth will eventually be stunted before it’s time. But there are many companies that are quite successful in their home markets and either stub their toes, or fail miserably, when they head into international markets–for a variety of reasons. You can read several more articles I’ve written more about international sales & marketing issues here. There are many more potential issues similar to those listed above that can throw a wrench into what may otherwise look like an ideal corporate or product strategy. I’m sure you can add to the list. At the end of the day strategy must be grounded by the realities facing the company, if it is to have the best chance of success. Some may find this limiting; indeed in a few instances it may be appropriate to throw caution to the wind and ignore where you’ve been and where you’re at now. This kind of thinking on occasion leads to a true a game-changing breakthrough for a company. But more often than not it leads to failures and firings. So what do you think–am I overstating the effects of these items on the outcome of strategic initiatives? Should a good strategy be enough to stand on its own? Let us know what you think with you own comments below.